A new, highly competitive Managed Care environment came to Texas long-term care on Mar. 1, 2015. The introduction of STAR+PLUS Managed Care program and MCOs marks a dramatic change for skilled nursing facilities. Use these resources to automate your workflow, stay in compliance and protect your reimbursement. [Webinar] Texas STAR+PLUS: We need to see your credentials! Beginning Apr. 1, 2018, all Texas nursing facilities must comply with new STAR+PLUS credentialing requirements. Watch this webinar to learn what’s changing and why, plus related changes like new STAR+PLUS performance standard requirements for 2019, value-based payments, and more. 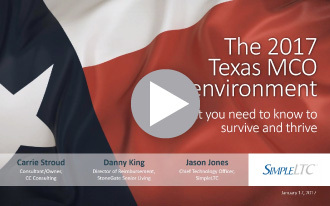 Get details about Texas MCO billing and administration from some of the state’s top experts, plus practical advice on managing workflow and protecting reimbursement. Learn the latest strategies for managing Texas MCO workflow and protecting your reimbursement. Plus see the latest SimpleLTC tools for Texas MCO reporting. 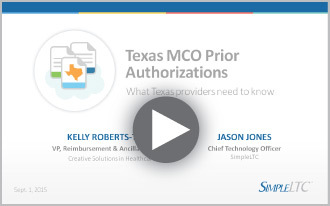 Learn about the new Texas Standard Prior Authorization Request Form, accepted by MCOs beginning Sept. 1, plus SimpleCFS™ functionality to automate Prior Auth processing. 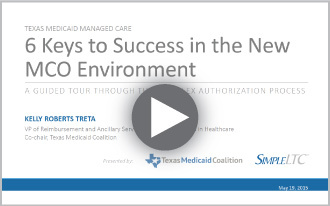 Get an update on the Texas Medicaid Managed Care/MCO transition, as well as important tips for navigating the complex authorization and reimbursement process. 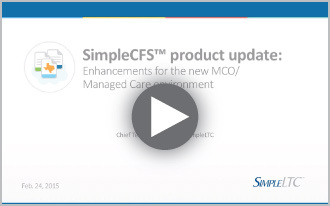 Nearly 80% of Texas facilities use SimpleCFS to automate Texas Medicaid. Here are several new features to help you manage your workflow under the new MCO structure. 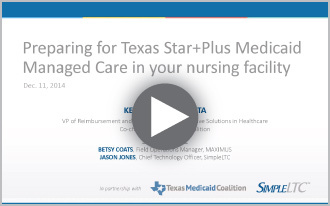 Presented by SimpleLTC and Texas Medicaid Coalition, this webinar provides important steps your facility should take to ensure you’re ready for the Mar. 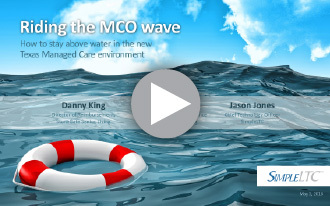 1 MCO/managed care changes. Download this free crosswalk resource as a quick reference guide for managing MCO prior authorizations. To help address customer questions, we’ve created an MCO FAQ support document and will continue to update it as new questions arise. Dozens of questions were asked during our webinar and Texas Medicaid Coalition has worked with HHSC to get answers to all of them.